I spend a lot of time thinking about long distance hiking and weekend backpacking. Sometimes I forget that not everybody can take the time to go on a long backpacking trip. It’s really a shame that I never get to touch on day hiking! What size pack do I need? How many liters of water should I carry? What type of snacks should I carry and how much gear do I actually need? What Do You Need on a Day Hike? 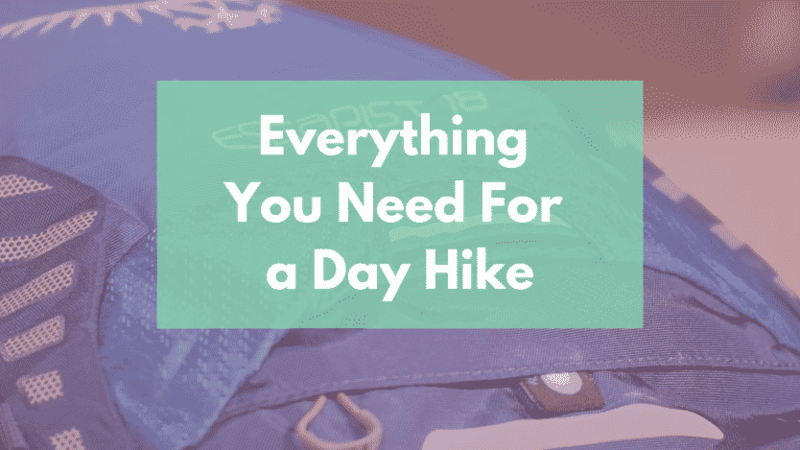 Since not everybody can get out on long hikes I’m going to take the opportunity to break my pack down and tell you all the gear I carry on a Day Hike. I’ve been doing a lot of day hiking lately and it got me thinking that I’ve never really talked about everything you need on a day hike. What’s the basic pack setup when you’re only going out for the day? I figured I’d break down my pack and tell you everything you need for the day. What Size Pack for a Day Hike? When choosing a pack for a day hike you really don’t need a huge pack. Typically I like to carry a smaller 15L-30L pack on a day hike. It all depends on where I’m hiking and what kind of gear I need for the day. Sometimes that means I’ll need to carry extra water, extra snacks, rain gear or maybe even some climbing gear. With a 15-30L pack you can make sure you aren’t carrying too much gear, but you still have enough if you get in a bad situation. I have a few packs that I cycle through, but I’ll typically carry a small Osprey Hikelite 18L Backpack. It’s fairly affordable with all those extra features that hikers need. You’ve got a 3L water reservoir, raincover, pole attachments and fully adjustable straps. To me this is the perfect day hiking pack. When I go on a longer hike in difficult terrain I’ll typically carry a larger Osprey Escapist 32L Pack. The larger pack allows me to carry more water, food and all the extra gear I need. If you can only afford one pack this is probably the one I’d choose. Your needs will probably vary depending on where you’re hiking and the difficulty of the terrain. That being said I always start out with the same basic list of gear. The amount of water you need will really depend on where you’re hiking. On those long all day hikes I’m probably going to use a hydration bladder. Shorter hikes I might just bring along a single 1 Liter bottle of water. Remember that water is surprisingly heavy so you shouldn’t bring more than you need, but you don’t want to run out. You’re better off carrying more water than you think you’ll need. Check out my post on preventing dehydration while hiking. Honestly, I rarely use a hydration bladder on day hikes. They’re kind of a pain to sanitize so I only use it on longer hikes or if I’m hiking hot desert terrain. You should always carry a water filter on any hike. It doesn’t matter if you’re going on a short 1 hour hike, you never know when you might need it. You never know when you’ll run into an emergency and need to filter water. For the price of a Sawyer Squeeze water filter it’s stupid not to carry one in your pack. Instead of a water bottle you might want to use the disposable Sawyer squeeze packs that fold up when not in use. Nobody can predict the weather so you should always bring along a light jacket. Just check the weather and figure out if you need a rain jacket. You don’t want to get caught in a downpour and be miserable for the rest of the day. If you know it’s not going to rain you can ditch the raincoat for a light windbreaker. Aside from the rain jacket I’m always going to bring along a light thermal jacket just in case. Personally I carry a Columbia Down Jacket that I got for Christmas a few years ago, but you really don’t need to spend a ton of cash. Any lightweight synthetic/down jocket will work. It doesn’t matter where you’re hiking you should always bring along a thermal jacket. You never know when you’ll get stuck overnight and need a jacket to warm you up. Doesn’t matter if I’ve packed a big lunch I always bring along extra snacks. Normally carry a half dozen protein bars, Clif Bars ETC. On extended hikes I might even bring a bagel or anything that will give me extra calories after a long day of hiking. I just want to make sure I have enough extra food in case I need to eat dinner on the trail. I’m a trekking pole guy so I’m always going to bring along a pair of poles. Even when I’m not planning on using them I strap them to my pack just in case. These are the poles that I carry. They’re lightweight and telescope down small so they’re easy to carry. If you’ve never used trekking poles you’re missing out. They shift the weight away from your knees and make extended hikes much easier. Here’s a great post teaching you how to use trekking poles. I always carry a pair of cheap polarized sunglasses in my pack even though 95% of the time I don’t end up using them. That being said they’re always in my pack just in case I get in a situation where I need them. The only time I really need sunglasses is when I’m hiking places that are really bright and open. It’s just always nice to protect your eyes and prevent those headaches caused by too much sunlight. If you don’t have a buff or bandana in your pack you’re missing out. You don’t realize how nice a buff is until you actually buy one. I actually carry two buffs that I cycle throughout the day. Always keep your phone in one of the outermost pockets so it’s easy to reach. You need to have easy access when you want to take a picture, make an emergency call or just use a hiking app. I’ve been using the All Trails and Gaia App a lot recently to find short nearby hikes. When I’m hiking a national park I typically get a park map and go old school. I always carry a small ditty bag to carry all my odds and ends that I need on the trail. This is wear I keep a small first aid kit, toiletries, sunscreen/bugspray, lighter, headlamp and a knife. Most of the time I won’t need to use this stuff, but I make sure it’s always in my pack. I just use a cheap dry sack I bought online that ended up being smaller than I was expecting. Most of the time I take pictures with my GoPro or iPhone Camera. I only bring along my professional DSLR when I’m expecting gorgeous views and I need to take really good photos.